And so we are here, the show is over. Without posting any spoilers or reviews, I just thought I should take the time to thank everyone who has contributed to Lost, from the cast and creative crew, down to the extras, catering, and anyone who made the show possible. I also wanted to thank everyone who has visited Lostpedia over the last 4 years, 8 months and 2 days, and made us the number one Lost fansite on the Internet, visited more than any other site. We are incredibly proud of everything that this community has done, both independently, and since we became part of Wikia. Thanks to Wikia too, that have brought stability, strength and features to the site in ways we could've never imagined. We aren't going anywhere. You'll have us around whenever you need us, and who knows, Damon and Carlton consider the show over, but I'm sure Disney see mileage in the show yet! The spoiler policy has been retired till there comes such a time where we may need it again. Lost is over. Long live Lost. Finally, we have ANSWERS. But answers, no matter what they are, are going to disappoint some people. And after the airing of "Across the Sea," some Lost fans and critics spoke out in frustration and disappointment in regards to the mysteries explained. There have been some poor reviews and reactions from fans and critics alike. Personally, I think this is one of the best episodes ever; it is a very well-written and well-crafted Lost episode. The mythology of Jacob and MIB is explored and uncovered brilliantly; I think it was interesting to see that they were once brothers who got along, and later became eternal enemies. I think the main thing that disappointed some people with the episode was not the answers, but rather, the demystification of Lost's enigmas. The mystery and enigma that encompasses the show is a cornerstone of the mythology, and when answers are given, the 'mystery' is gone. Mainly, this episode demystified the smoke monster's origins, as well as the origin of the mysterious electromagnetic properties of the island. However, I think it's good to demystify some things; it comes along with getting answers to some of our long sought after questions regarding the mythology. Would it be good if Lost answered every single question and demystified every enigma ever brought up in the show? Not at all. It's good to leave some mystery, and also to answer some questions. This episode did a tremendous job at unraveling some answers as well as revealing the backstory of Jacob and the Man in Black. Everyone is definitely entitled to their opinions, but I personally find the backlash towards this episode to be unwarranted; I thought it was a very well done episode. So what mysteries were explained? Well, we got the long-awaited backstory of Jacob and the Man in Black (who, still has not been named). 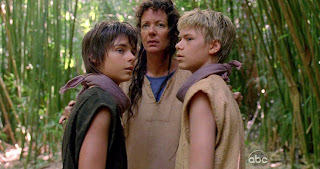 It is revealed that they are brothers, brought to the Island by their mother, Claudia, after a mysterious shipwreck nearly two thousand years ago. Immediately after their birth, Claudia was killed by "Mother," a mysterious island inhabitant. Mother goes on to raise Jacob and MIB under her protection and guidance. She seemingly shows favor to MIB. In the Bible, Rebekah loved Jacob, while Isaac loved Esau. "Isaac, who had a taste for wild game, loved Esau, but Rebekah loved Jacob." (Genesis 25:28). It's interesting that, likewise, the Mother shows favor to one of the kids (in this case, MIB, who has often been nicknamed 'Esau' by fans, reflecting the Biblical parallel). We see Jacob and MIB playing a game with each other - which once again brings to mind 'good vs. evil' and the many allusions to this throughout the show. Jacob and MIB later come across people on the island. As far as we know, these people are some of the earliest inhabitants that have ever been on the island. The children go tell Mother, who says something regarding these men that we have heard before: "They come, they fight, they destroy, they corrupt. It always ends the same." This exact statement is later re-stated by MIB in "The Incident, Part 1" just prior to Richard's arrival on the Black Rock. This episode brings back another very interesting question: who is really evil, Jacob or MIB? Well, for the most part throughout this season, we've been led to believe that MIB is really the evil one. He has killed some beloved characters (Eko, Montand, Seth Norris, Bram, etc), massacred many Others in "Sundown," thrown Desmond into a well, and attempted to kill the remaining candidates, Jack, Sawyer, Hugo, Sun/Jin, and Sayid with explosives. Yes, there is much evidence suggesting that he is the evil one. Jacob even explained to his ambassador, Richard, in "Ab Aeterno" that MIB is evil and his goal is to escape the island (cork) in order to spread evil (wine). But in "Across the Sea," Jacob is brought to the heart of the island, the source of light, and drinks wine, promising to be the protector of the source. In doing this, his Mother says that he is like her now. The Mother seems to be inherently evil, and if Jacob is now "like her," is he consequently evil? The MIB separated himself from Mother and Jacob, following an apparition from his real mother, Claudia. So this begs the question: who was ghost Claudia? An island apparition, the smoke monster in human form? Perhaps there was another smoke monster prior to MIB's encounter with the source. I still don't think it's safe to say Jacob is evil and MIB is good - in fact, the contrary seems more likely from what we've seen thus far. However, hopefully we will get more revelations regarding either Jacob and/or MIB in next week's penultimate series episode, "What They Died For." As adults, Jacob and MIB continue to converse and talk with each other. MIB resides in a village with some inhabitants, and currently works inside a well. He is determined to harness the power of the source of the island, but admitted that he had relentlessly searched the island for the source Mother had brought them to, but was unable to find it. MIB tells Jacob that there are special electromagnetic properties on the island, and that his intent is to find what's across the sea. Mother later goes to say good-bye to MIB, and in doing so slams his head on a wall. When MIB awakes, the entire village is burned and destroyed, and the people are killed. So how did Mother go about doing this? Does she have special powers? Is she the smoke monster? Hopefully these answers will be revealed in the coming weeks. So who is Mother? Although she was only mentioned once before in "Recon," she is a prominent figure in the Lost mythology. Although for a long time I thought that Jacob and MIB's backstory would reveal the key aspects of the island, now we have this mysterious Mother, who's backstory and history is unknown. Is she the first person to ever be on the island? Is she essentially the Island personified? Questions regarding the Mother are abundant, and I hope that her origins are revealed in the finale. MIB later goes to find Mother, and stabs her in the back. MIB asked why she didn't want him to leave. She looks at him, and tells MIB that she loves him. Jacob sees this, and brings him to the river, throwing him into the source. The smoke monster comes billowing out, sweeping into the jungle. Jacob sees MIB's body in a tree, and buries him along with Mother - we now know that they are Adam and Eve, who were found by Jack, Kate and Locke back in "House of the Rising Sun." This makes me wonder: could Mother have really been the smoke monster? We've seen Sayid attempt to stab him in the heart, and that didn't work. However, he also didn't follow Dogen's directions, who said to "not let him speak to you." MIB did not let Mother speak, so perhaps this is why she died? However, the Mother being a smoke monster is still a theory with not much evidence. Overall, I thought this was a tremendous episode - probably one of the top ten of the series. I thought that the backstory of Jacob and MIB was well done, and the storyline was intriguing and mythology-rich. I was glad to get some long-awaited answers: the origin of the smoke monster, backstory of Jacob-MIB, and the origin of 'Adam and Eve'. Another very strong point of the episode was the acting; Titus Welliver delivered an incredible performance as the Man in Black. His acting has been very stellar throughout the show. There is only one more episode before the epic finale of LOST - more answers and revelations are sure to be revealed. Feel free to discuss your thoughts, theories, views, and opinions of "Across the Sea." Go behind the scenes of the hit series. Live in HD at a movie theater near you. Don't miss this compelling in-depth conversation with the masterminds behind ABC’s “LOST.” Hear executive producer Carlton Cuse and co-creator/executive producer Damon Lindelof reveal the challenges of crafting a finale that satisfies themselves as storytellers, and the show’s legion of fans. They will be interviewed by New York Times entertainment editor Lorne Manly and the event will be broadcast live via satellite from The TimesCenter in New York for only one night, on Thursday, May 20, at 8 pm ET / 7 pm CT / 6 pm MT and tape delayed at 8 pm PT exclusively to select movie theaters across the U.S. and Canada. Fans can submit a question in advance for Mr. Cuse or Mr. Lindelof via email to timestalks@nytimes.com. Be sure to include your location (city, state) with your question. Note: only a limited number of questions received will be submitted to the moderator. A presentation of The New York Times and BY Experience.